How does a viewer's eye navigate an image's composition, and how can photographers influence the process when framing the image? 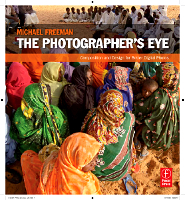 Michael Freeman goes in-depth on everything from aspect ratios to Fibonacci divisions in this excerpt from his Focal Press book. This excerpt from The Photographer's Eye is provided courtesy of Focal Press. To purchase the book and learn more about the publisher, visit the Focal Press website. Photographs are created within a spatial context, and that context is the viewfinder frame. This may be carried through unchanged to the final image, whether print or on-screen, or it may be cropped or extended. In whichever case, the borders of the image, nearly always a rectangle, exert strong influences on what is arranged inside them. There is an important distinction, nevertheless, between composing photographs in the frame as they are intended to be, and planning ahead to either crop or extend the frame. Most 35mm film photography has been concerned with tight, final composition at the time of shooting, and at times this has led to a culture of demonstrating the fact by showing the rebates (the frame edges of the film) in the final print—a way of saying “hands off” once the shutter has been released. Square-format film, as we’ll see below, is less amenable to comfortable composition, and is often used for later cropping. Large format film, such as 4x5-inch and 8x10-inch, is large enough to allow cropping without much loss of resolution in the final image, and is also often cropped, particularly in commercial work. Now digital photography adds its own twist to this, as stitching becomes more widely used for panoramas and over-sized images. In traditional, shooting-to-the-final-composition photography, the frame plays a dynamic role, and arguably more so than in painting. The reason is that while a painting is built up from nothing, out of perception and imagination, the process of photography is one of selection from real scenes and events. Potential photographs exist in their entirety inside the frame every time the photographer raises the camera and looks through the viewfinder. Indeed, in very active, fast shooting, such as street photography, the frame is the stage on which the image evolves. Moving around a scene with the camera to the eye, the frame edges assume a considerable importance, as objects move into frame and immediately interact with them. The last chapter in this book, Process, deals with managing this constantly changing interaction between view and frame edges. It is complex, even when dealt with intuitively. If the subject is static, like a landscape, it is easy to spend enough time studying and evaluating the frame. With active subjects, however, there is not this period of grace. Decisions about composition, whatever they are, must often be taken in less time than it takes for them to be recognized as such. Facility at using this frame depends on two things: knowing the principles of design, and the experience that comes from taking photographs regularly. The two combine to form a photographer’s way of seeing things, a kind of frame vision that evaluates scenes from real life as potential images. What contributes to this frame vision is the subject of the first section of this volume. The setting for the image is the picture frame. In photography, the format of this frame is fixed at the time of shooting, although it is always possible later to adjust the shape of the frame to the picture you have taken. Nevertheless, whatever opportunities exist for later changes (see pages 58-61), do not underestimate the influence of the viewfinder on composition. Most cameras offer a view of the world as a bright rectangle surrounded by blackness, and the presence of the frame is usually strongly felt. Even though experience may help you to ignore the dimensions of the viewfinder frame in order to shoot to a different format, intuition will work against this, encouraging you to make a design that feels satisfying at the time of shooting. The most common picture area is the one shown below: that of a horizontal frame in the proportions 3:2. Professionally, this is the most widely used camera format, and holding it horizontally is the easiest method. As an empty frame it has certain dynamic influences, as the diagram shows, although these tend to be felt only in very minimal and delicately toned images. More often, the dynamics of lines, shapes, and colors in the photograph take over completely. Depending on the subject and on the treatment the photographer chooses, the edges of the frame can have a strong or weak influence on the image. The examples shown here are all ones in which the horizontal and vertical borders, and the corners, contribute strongly to the design of the photographs. They have been used as references for diagonal lines within the pictures, and the angles that have been created are important features. What these photographs demonstrate is that the frame can be made to interact strongly with the lines of the image, but that this depends on the photographer’s intention. If you choose to shoot more loosely, in a casual snapshot fashion, the frame will not seem so important. Compare the structural images just below with the less formally composed picture taken on a Calcutta street on page 165. Just the existence of a plain rectangular frame induces some reaction in the eye. This is one schema of how the eye might react (there are, of course, many). It begins in the middle, drifts up and left, then back down, and right, while at some point—either through peripheral vision or by flicking—registers the “sharp” corners. The dark surround seen through a camera viewfinder emphasizes corners and edges. One simple device for originating an image that has prominent lines is to align one or two of them with the frame. In the case of this office block, the alignment of top edges avoids the untidiness of two corner areas of sky. Alignment like this emphasizes the geometry of an image. The dynamic movement in this wide-angle photograph comes from the interplay of diagonals with the rectangular frame. Although the diagonal lines have an independent movement and direction, it is the reference standard of the frame edges that allows them to create tension in this picture. Breaking the normal rules, a panoramic frame is used here to exaggerate an abstract treatment of the back of an adobe church in New Mexico. A conventional approach would have been to show the top of this building and the lower buttressing down to the ground. The subject here, however, is not a literal version of the church, but the geometry and textures of the unusual planes. Squeezing the image at the top and bottom removes some of the realism, and compels the eye to consider the structure out of context. This is the width-to-height ratio of an image or display. Here, for consistency, we assume the width is longer, unless referring to a specific vertical image. So, a standard SLR frame is 3:2, but composed vertically is 2:3. The shape of the viewfinder frame (and LCD screen) has a huge influence on the form that the image takes. Despite the ease of cropping it later, there exists a powerful intuitive pressure at the time of shooting to compose right up to the edges of the frame. Indeed, it takes years of experience to ignore those parts of an image that are not being used, and some photographers never get used to this. Most photography is composed to a few rigidly defined formats (aspect ratios), unlike in other graphic arts. Until digital photography, by far the most common format was 3:2—that of the standard 35mm camera, measuring 36x24mm—but now that the physical width of film is no longer a constraint, the majority of low- and middle-end cameras have adopted the less elongated, more “natural” 4:3 format that fits more comfortably on printing papers and monitor displays. The question of which aspect ratios are perceived as the most comfortable is a study in its own right, but in principle, there seems to be a tendency toward longer horizontally (the increasing popularity of widescreen and letterbox formats for television), but less elongated for vertically composed images. This is the classic 35mm frame, which has been transferred seamlessly to digital SLRs, creating in the process a sort of class distinction between professional and serious amateur photographers on the one hand, and everyone else on the other. The reason for these proportions is a matter of historical accident; there are no compelling aesthetic reasons why it should be so. Indeed, more “natural” proportions would be less elongated, as evidenced by the bulk of the ways in which images are displayed—painting canvases, computer monitors, photographic printing paper, book and magazine formats, and so on. Part of the historical reason was that 35mm film was long considered too small for good enlargements, and the elongated shape gave more area. Nevertheless, its popularity demonstrates how easily our sense of intuitive composition adapts. Overwhelmingly, this format is shot horizontally, and there are three reasons for this. The first is pure ergonomics. It is difficult to design a camera used at eye level so that it is just as easy to photograph vertically as horizontally, and few manufacturers have even bothered. SLRs are made to be used for horizontal pictures. Turning them on their side is just not as comfortable, and most photographers tend to avoid it. The second reason is more fundamental. Our binocular vision means that we see horizontally. There is no frame as such, as human vision involves paying attention to local detail and scanning a scene rapidly, rather than taking in a sharp overall view all at once. Our natural view of the world is in the form of a vague-edged, horizontal oval, and a standard horizontal film frame is a reasonable approximation. The final reason is that 3:2 proportions are often perceptually too elongated to work comfortably in portrait composition. The net result is that a horizontal frame is natural and unremarkable. It influences the composition of an image, but not in an insistent, outstanding way. It conforms to the horizon, and so to most overall landscapes and general views. The horizontal component to the frame encourages a horizontal arrangement of elements, naturally enough. It is marginally more natural to place an image lower in the frame than higher—this tends to enhance the sensation of stability— but in any particular photograph there are likely to be many other influences. Placing a subject or horizon high in the frame produces a slight downward-looking, head-lowered sensation, which can have mildly negative associations. For naturally vertical subjects, however, the elongation of a 2:3 frame is an advantage, and the human figure, standing, is the most commonly found vertical subject—a fortunate coincidence, as in most other respects the 2:3 proportions are rarely completely satisfactory. Our natural view of the world is binocular and horizontal, so a horizontal picture format seems entirely normal. The edges of vision appear vague because our eyes focus sharply at only a small angle, and the surrounding image is progressively indistinct. Note, however, that this is not conventional blurring, as edges can be detected with peripheral vision. The limits of the view, here shown in gray, are also normally not perceived, just ignored. The correspondence of the horizon line and the format makes a horizontal frame natural for most long scenic views. This is the first sight for visitors of Blenheim Palace, Oxford, and its landscaped grounds were christened at the time it was built “the finest view in all of England.” The length is necessary for this controlled scene, but depth is not. Its extra length when compared to the 4:3 frame of consumer cameras and most monitor displays makes this aspect ratio interesting to work in. There is always a sense of horizontality. In this photograph of the Lord Mayor’s Show in the City of London, the basic structure depends on a balance between the soldier in the left foreground and the ornate coach behind, with a clear left-to-right vector and a distinct feeling of depth. Traditionally, and once again with digital photography and on-screen presentations, these “fatter” frames are the most “natural” image formats. In other words, they are the least insistent and most accommodating to the eye. In the days when there was a rich variety of large-format film, formats included 5×4-inch, 10×8-inch, 14×11- inch, and 8½×6½-inch. There is now a reduced choice, but the proportions all work in much the same way, and equally for rollfilm formats, digital backs, and lower-end digital cameras. In terms of composition, the frame dynamics impose less on the image, because there is less of a dominant direction than with 3:2. At the same time, that there is a distinction between height and width is important in helping the eye settle into the view, with the understanding that the view is horizontal or vertical. Compare this with the difficulties of a square format, which often suffers from lack of direction. As noted opposite, these proportions are very comfortable for most vertically composed images. In these photographs of a man sleeping on the Khyber railway, the natural balance occurs when his head is placed slightly low in the vertical shot, and to one side in the horizontal. Seen vertically from the air, the multi-hued Grand Prismatic Spring in Yellowstone National Park naturally fits a horizontal frame. Nevertheless, a vertical was also needed for possible full-page use. Switching to vertical meant placing the subject lower in the frame and finding another element (another spring) to fill the void above. Although this format is not very well suited to vertical subjects like standing figures and tall buildings, inertia often encourages photographers to make it work as well as possible. One technique is to off-center the subject like this, so as to persuade the eye to move horizontally, across the frame. 4:3, 5:4, and similar “fatter” frame shapes tend to dominate composition less than 3:2 or panoramas. There is usually more flexibility at the time of shooting. Indeed, this horizontal of Angkor Wat in Cambodia was eventually cropped in at the sides and used for a book cover. As explained, there is a slight natural resistance to photographing vertically, even though print media actually favor this orientation because of the normal format of magazines and books (for this reason, professional photographers usually make an effort to shoot vertically as well as horizontally because of client demands). The naturalness of horizontal vision reinforces the eye’s desire to scan from side to side, and a corresponding reluctance to scan up and down. With a non-elongated subject, most people tend to place it below the center of the frame, and the more elongated the format, the lower, proportionately, the object goes. The natural tendency with a dominant single subject is to push the focus of attention downward, and demonstrates an inclination to avoid the upper part of a vertical frame. One explanation for this is that, as with horizontal frames, there is an assumption that the bottom of the picture is a base: a level surface on which other things can rest. This works unremarkably with 3:4 proportions, but the 2:3 proportions of an SLR frame are a little extreme, and this often leaves the upper part of the picture under-used. The eye is naturally reluctant to scan up and down, and the bottom edge of a picture frame represents a base; thus gravity affects vertical composition. Subjects tend to be placed below the center, the more so with tall formats, as in this shot of a Bangkok river boat (the direction of movement also suggested a low placement). The standing human figure is one of several classes of subject which suits a vertical format. Others include tall buildings, trees, many plants, bottles, and drinking glasses, doorways and archways. Patterns and other formless arrangements fit well into a square format because the frame has no directional emphasis. Under these circumstances, it does not intrude on the image. While all other photographic frames are rectangular, with varying proportions, one is fixed: the square. A few film cameras have this unusual format—unusual in that very few images lend themselves well to square composition. In general, it is the most difficult format to work with, and most design strategies for a square frame are concerned with escaping the tyranny of its perfect equilibrium. We ought to look a little more closely at why most subjects are ill-suited to a square arrangement. In part, this has to do with the axis of the subject. Few shapes are so compact that they have no alignment. Most things are longer in one direction than in another, and it is natural to align the main axis of an image with the longer sides of a rectangular picture frame. Hence, most broad landscape views are generally handled as horizontal pictures, and most standing figures as verticals. The square, however, has absolutely no bias. Its sides are in perfect 1:1 proportions, and its influence is a very precise and stable division of space. Here lies the second reason for the unsympathetic nature of square proportions: they impose a formal rigidity on the image. It is hard to escape the feeling of geometry when working with a square frame, and the symmetry of the sides and corners keeps reminding the eye of the center. Occasionally a precise symmetrical image is interesting; it makes a change from the normally imprecise design of most photographs. However, a few such images quickly become a surfeit. It is fairly normal for photographers who work consistently with a square-format camera to imagine a vertical or horizontal direction to the picture, and to crop the resulting image later. Practically, this means composing fairly loosely in the viewfinder, to allow a certain amount of free space either at the sides or at the top and bottom. The equal dimensions of a square frame make it susceptible to symmetrical division, as these examples show. Vertical and horizontal lines enhance the square’s stability; diagonals are more dynamic. 1. With its strongly implied center and equal sides, a square format takes very easily to a radial composition. Radial and other completely symmetrical subjects are particularly well-suited to the perfect equilibrium of the square. Their precision is complementary, but exact alignment is essential. 2. There is a precise relationship between the square and circle. Fitting one concentrically in the other emphasizes the sensation of focus and concentration on the center. 3. A natural subdivision is by vertical and horizontal lines, although the effect is extremely static. 4. A more dynamic, but still centered, subdivision is by means of diagonals and diamonds. Digital stitching software has evolved into a widely used tool for creating images that are larger and wider. These are actually two separate functions. Shooting a scene with a longer focal length in overlapping frames is one technique for achieving higher resolution and so larger printed images—an equivalent of large-format photography. From the point of view of this book, however, the interest is in changing the shape of the final image. This tends to be panoramic, as long horizontal images have an enduring appeal for reasons we’ll go into shortly, but there is also complete freedom, as the examples here show. What is often overlooked is the effect this stitching has on the process of shooting, because it demands anticipation of how the final image will look. There is no preview at the time, and this is a situation new to photography—that of having to imagine what the final image and frame shape will be. It gives stitched, extended images an unpredictability which can be refreshing. Panoramas have a special place in photography. Even though proportions that exceed 2:1 seem to be extreme, for landscapes and other scenic views, they are actually very satisfying. To understand why, we have to look again at the way human vision works. We see by scanning, not by taking in a scene in a single, frozen instant. The eye’s focus of attention roams around the view, usually very quickly, and the brain builds up the information. All of the standard photographic formats—and most painting formats, for that matter—are areas that can be absorbed in one rapid scanning sequence. The normal process of looking at the picture is to take in as much as possible in one prolonged glance, and then to return to details that seem interesting. A panorama, however, allows the eye to consider only a part of the image at a time, but this is by no means a disadvantage, because it replicates the way we look at any real scene. Apart from adding an element of realism to the picture, this slows down the viewing process, and, in theory at least, prolongs the interest of exploring the image. All of this depends, however, on the photograph being reproduced fairly large and viewed from sufficiently close. This virtue of the panorama—to draw the viewer in and present some of the image only to the peripheral vision—is regularly exploited in the cinema, where an elongated screen is normal. Special projection systems, such as Cinerama and IMAX, are premised on the realistic effect of wrapping the image around the viewer. Still panoramic images have a similar effect. The frame can also be extended in post- production in other ways, by stretching (using warping, distortion, and other geometric software tools, and even by cloning). Certain images lend themselves to being extended in one or more directions—for instance, extending the sky upwards, or widening the background in a studio still-life. Magazine layouts often suggest this, although there are ethical considerations with this kind of manipulation, in that the final image is not necessarily as it was seen. In this stitched panoramic view, much of the sky and the foreground are removed, leaving the eye free to follow the rhythm of the horizon line and the interaction of cloud and mountain. Treated like this, a large number of natural landscapes fit very comfortably into stretched proportions. eight overlapping horizontal images were shot. A sequence of five overlapping frames was shot for this view of white chalk cliffs near Dover, england. Normally, stitched panoramas are shot with the camera carefully levelled so that the horizon will be straight. Pointing the camera down prevents this because of the strong curved distortion, but here it was put to deliberate use. The arc-shaped frame was cut at the end of the process. For a large-scale image and extra-wide coverage, a perspective-control shift lens was rotated, frame by frame, at full shift. Stitching these 13 images is, in a sense, the digital equivalent of large-format photography. Normally, this redented shape would be cropped, but here it has been left, not only to show the process but to be part of the form of the image. Cropping is an editing skill that was highly developed during the days of black-and-white photography, lapsed somewhat in the color slide era, and is now revived fully as an integral part of preparing the final digital image. Even when the framing as shot is judged to be fine, technical adjustments such as lens distortion correction will demand it. Cropping is one way of reworking the image well after it has been shot; an option for deferring design decisions, and even of exploring new ways of organizing an image. Unlike stitching, however, it reduces the size of the image, so demands a high resolution to begin with. In traditional enlarger printing, the enlarging easel itself acts as a cropping guide, but it may be easier to experiment first with L-shaped cropping masks on film (on a light box) or a contact sheet. With digital images (or scanned film), the process is infinitely easier and clearer, using software cropping tools. It is important not to think of cropping as a design panacea or as an excuse for not being decisive at the time of shooting. The danger of having the opportunity to alter and manipulate a frame after it is shot is that it can lull you into imagining that you can perform a significant proportion of photography on the computer. Cropping introduces an interruption in the process of making a photograph, and most images benefit from continuity of vision. For this Thai landscape, the several viable alternatives are shown together, superimposed on a black-and-white version of the image. The abandoned temple itself must remain the dominant element in the image—there is nothing else—and the choices are in the placement of the horizon line and in whether or not to include the clump of bamboo on the left. Placing the horizon low (purple and green frames) gives a more spacious, open feeling and emphasizes what is happening in the sky (sunrise and some threatening clouds). raising the horizon line (red frame) draws attention to the rice in the field. a vertical crop (blue) also needs a significant area of rice to keep it anchored. In the case of this misty landscape on the Isle of Skye, let’s look at the kind of decisions involved. The original framing has clearly been chosen to make something of the rippled clouds at the top of the frame, and the horizon has been placed correspondingly low. This in itself reduces our options a little. 1. Perhaps the first, obvious crop is to ignore the high clouds and concentrate instead on the mist- shrouded qualities of the rocky pillars. Now, once we have dispensed with the clouds, there are no limits to how far down we can crop the top of the frame. In this instance, I have chosen to reverse the proportion of land to sky, and to take the opportunity to make a panorama. This is a viable alternative to the original picture, although it really needs to be considerably enlarged for the best possible effect. 2. Next, what if we try to crop in and still retain moderate horizontal proportions? Unfortunately, it seems that if there is to be any significant area of sky, it should go right to the existing top of the frame, simply in order to provide some tone and weight in that part of the picture. Cropping in at the sides does very little to enhance the importance of the pillars. The only reasonable option will be to crop the bottom, and go for a horizon line that almost coincides with the base of the picture. 3. Is a vertical crop possible? Given that an upright image has even more need of the tonal weight of the clouds, the best that we can do is to crop in at the sides. The choices are informed by selecting the most interesting shapes on the horizon. In order to be able to talk about the different graphic elements in composition, and to look at the way they interact, the first thing we must do is to isolate them, choosing the most basic situations for composing pictures. A little caution is needed here, because in practice there is usually a multitude of possibilities, and a single, isolated subject is something of a special case. The examples here may seem a little obvious, but at this stage we need clear, uncluttered examples. The most basic of all photographic situations is one single, obvious subject in front of the camera, but even this presents two options. We have an immediate choice: whether to close right in so that it fills up the picture frame, or to pull back so that we can see something of its surroundings. What would influence the choice? One consideration is the information content of the picture. Obviously, the larger the subject is in the photograph, the more detail of it can be shown. If it is something unusual and interesting, this may be paramount; if very familiar, perhaps not. For example, if a wildlife photographer has tracked down a rare animal, we would reasonably expect to see as much of it as possible. Another consideration is the relationship between the subject and its setting. Are the surroundings important, either to the content of the shot or to its design? In the studio, subjects are often set against neutral backgrounds; then the setting has nothing to tell the viewer, and its only value is for composition. Outside the studio, however, settings nearly always have some relevance. They can show scale (a climber on a rock-face) or something about the activity of the subject. A third factor is the subjective relationship that the photographer wants to create between the viewer and the subject. If presence is important, and the subject needs to be imposing, then taking the viewer right up to it by filling the frame is a reasonable option. There are some mechanical matters involved, such as the ultimate size of the picture when displayed, the focal length of lens, and the scale of the subject to begin with. Nevertheless, a big subject filling the frame of a big picture usually acquires force and impact. Moreover, as the examples here show, there can also be a satisfying precision in just matching subject to frame—particularly if the image has to be composed rapidly. The shape of the subject in relation to the format of the frame clearly has an effect. In the sequence of the Hong Kong ferry on the right, the main picture shows a very satisfactory fit: the boat from this angle just reaches the edges all round. In the majority of single-subject pictures, however, the focus of attention does not fill the frame. The shape may not coincide with the format of the picture (cropping is always possible, but it is not necessarily elegant, and it may not suit the intended display method). Another possible risk with running the edges of the subject right up to the borders of the picture is that the eye may feel uncomfortable concentrating on points falling very near the edges of the picture. It often needs—or at least benefits from—a little free area around a subject to be able to move without feeling constricted. Two southern Sudanese boys using plastic filters to drink from a pond. Just fitting with little to spare, like this, usually means quick work with either feet or a zoom lens. In this case, there is room to spare at the top and bottom, but this usefully shows the uniform covering of duckweed, apparently limitless. Digital cameras offer two possibilities for active composition—looking through the viewfinder in the traditional way, or the newer method of looking at the two-dimensional LCD screen. The argument for the latter is that it eases the translation from a 3D scene to a 2D image. For active framing, this applies only to cameras without moving prism mechanisms (not SLRs). Even when using the viewfinder, the LCD offers a very useful review, not just of technical matters, but composition also. 1. The success of this shot depends almost entirely on perfect timing as the ferry approaches the camera. Although it may not be immediately obvious, much of the design appeal of this photograph lies in the almost exact fit of the boat’s shape to the 35mm frame. A little earlier, with more water showing around the edges, would have been more ordinary; a fraction later would have looked like a mistake. The ferry in this picture feels large; it has presence. 2. Pulling back gives a more typical subject-in-its-setting treatment. Successful because of the crisp lighting but more ordinary than the previous photograph, the setting in this case can be taken as read; we know the ferry must be on water, and because there is nothing unusual about it (heavy waves or interesting color), it adds little to the picture. 3. A different kind of context shot. More informative than attractive in its design, this shows us less about the ferry but more about where it is and what it does. 4. Over-filling the frame takes us into the structural details of a subject. Here, the lifebelts inform us that this is a boat, but the definition of the subject has altered: this picture is now concerned as much with the people as with the ferry. In any construction involving one, obvious subject, other than filling the frame with it, there is always the decision of where to place it, remaining sensitive to the proportions of the space surrounding it. As soon as you allow free space around the subject, its position becomes an issue. It has to be placed, consciously, somewhere within the frame. Logically, it might seem that the natural position is right in the middle with equal space around, and indeed, there are many occasions when this holds true. If there are no other elements in the picture, why not? One compelling reason why not is that it is very predictable—and, if repeated, boring. We are faced with a conflicting choice. On the one hand, there is a desire to do something interesting with the design and escape the bull’s-eye method of framing a subject. On the other hand, placing the subject anywhere but in a natural position needs a reason. If you place a subject right in the corner of an otherwise empty frame, you need a justification, or the design becomes simply perverse. Eccentric composition can work extremely well, but as we will see later in the book, its success depends on there being some purpose behind it. The importance of placement increases as the subject becomes smaller in the frame. In the photograph of the sentry on page 15, we are not really conscious that the figure is actually in any position in the frame. It is, in fact, centered but with not so much space around it as to be obvious. With the photograph of the water- bound hamlet here, we are made very aware of its position in the frame because it is obviously isolated and surrounded by ocean. Some off- centeredness is usually desirable simply in order to set up a relationship between the subject and its background. A position dead center is so stable as to have no dynamic tension at all. If slightly away from the middle, the subject tends to appear to be more in context. There are also considerations of harmony and balance, which we’ll come to in the next chapter. In practice, other elements do creep into most images, and even a slight secondary point of interest is usually enough to influence the placement of the subject. In the case of the stilted houses, we aware of the position of the sun above and left; there is an inferred relationship here, one that makes it natural to offset the houses slightly in the opposite direction. Vectors can also influence an off-center position. For instance, if the subject is obviously in motion, and its direction is plain, then the natural tendency is to have it entering the frame rather than leaving it. I emphasize the word natural, however, because there may always be special reasons for doing things differently—and different usually gets more attention. In a more general sense, subjects that “face” in one direction (not necessarily literally) also often fit more comfortably so that they are offset, so that some of the direction they see is in the frame. As a rule of thumb, when the setting is significant—that is, when it can actually contribute to the idea behind the picture—then it is worth considering this kind of composition, in which the subject occupies only a small area. In the case of the houses in the sea, the whole point of the picture is that people live in such unusual circumstances: surrounded by water. Closing in would miss the point. Unfortunately, moving further back would only reduce the size of the houses so much that they would be indecipherable, although it would show still more ocean. The purpose of this aerial view of stilted houses built in the middle of the Sulu Sea in the Philippines is to draw attention to their unusual and isolated location. Off-centering the subject brings some life to the design, and encourages the eye to move from the houses towards the upper left corner of the frame. This is an exercise in placement. The overall view shows that the old bench is next to a pond and surrounded by green, although the foreground is more continuous than the background, where patches of sky can be seen. For this last reason, closing in meant keeping the bench near the top of the frame. 1. The first attempt was a tight fit, and the gaps marked with parallel blue lines are where the framing decision has to be made. 2. Pulling back offers two choices. In this, the diagonals of the bench are considered dominant, so the placement is offset against them, to the right. 3. Alternatively, the bench, waiting for someone to sit, can be thought of as “facing” right and down. To counter this, it is placed on the left. 4. Now a horizontal attempt. Here it definitely makes sense to consider its right-facing aspect, so it is placed at left, facing in. 5. Pulling back reveals the edge of the pond. This is now a second subject added to the image, and the framing attempts to balance the two. Any image, of any kind, automatically creates a division of the picture frame. Something like a prominent horizon line does this very obviously, but even a small object against a bland background (a point, in other words) makes an implied division. Look at any of the pictures in this book which comprise a single small subject— shifting the position of the subject changes the areas into which the frame is divided. There are, naturally, an infinite number of possible divisions, but the most interesting ones are those that bear a definable relationship to each other. Division is essentially a matter of proportion, and this has preoccupied artists in different periods of history. During the Renaissance, in particular, considerable attention was given to dividing the picture frame by geometry. This has interesting implications for photography, for while a painter creates the structure of a picture from nothing, a photographer usually has little such opportunity, so much less reason to worry about exact proportions. Nevertheless, different proportions evoke certain responses in the viewer, whether they were calculated exactly or not. During the Renaissance, a number of painters realized that proportions of division based on simple numbers (like 1:1, 2:1, or 3:2) produced an essentially static division. By contrast, a dynamic division could be made by constructing more interesting ratios. The Golden Section, which was known to the Greeks, is the best known “harmonious” division. As outlined below, the Golden Section is based on pure geometry, and photographers almost never have either the need or the opportunity to construct it. Its importance lies in the fact that all the areas are integrally related; the ratio of the small section to the large one is the same as that of the large section to the complete frame. They are tied together, hence the idea that they give a sense of harmony. The logic of this may not seem completely obvious at first, but it underlies more than just the subdivision of a picture frame. The argument is that there are objective physical principles that underlie harmony. In this case, they are geometric, and while we may not be aware of them in operation, they still produce a predictable effect. The subdivision of a standard 3:2 frame according to the Golden Section is shown here. Precision is not of major importance, as the photographs show. The Golden Section is not the only way of making a harmonious division. It is not even the only method in which the ratios are integrally related. Another basis, also from the Renaissance, is the Fibonacci series—a sequence of numbers in which each is the sum of the previous two: 1, 2, 3, 5, 8, 13, and so on. In yet another method, the frame is subdivided according to the ratio of its own sides. There is, indeed, a massive variety of subdivisions that obey some internal principle, and they all have the potential to make workable and interesting images. This is all very well for a painter or illustrator, but how can photography make sensible use of it? Certainly, no-one is going to use a calculator to plan the division of a photograph. Intuitive composition is the only practical approach for the majority of photographs. The most useful approach to dividing a frame into areas is to prime your eye by becoming familiar with the nuances of harmony in different proportions. If you know them well, intuitive composition will naturally become more finely tuned. As photographers, we may be able to ignore the geometry, but we can not ignore the fact that these proportions are fundamentally satisfying. Notice also that, by dividing the frame in both directions, an intersection is produced, and this makes a generally satisfying location for a point, or any other focus of attention. Compare this with the off-center placement of small subjects on pages 66-69. In photography, this is analysis after the event; no photographer ever calculates this, but familiarity with these proportions makes it easy to reproduce them, more or less, in a composition instinctively. The frame on the left is in the ratio 1.618, or 144:89, which argues for its being aesthetically pleasing and balanced. For more on ratios and the principle of balance, see pages 40-43. For comparison, on the right is the standard 35mm (now digital SLr) frame in the ratio 3:2. They are by no means dissimilar. In principle, any subdivision of the frame that is integrated internally produces a sense of harmonious balance. These are some examples, taken from Maurice de Sausmarez, the first being from the Fibonacci series (see page 26). Other coherent methods include creating a geometric base using the frame’s own sides. most of the useful subdivisions are rectilinear, but diagonals can also be used to create triangular spaces. In the example here, the composition was of course intuitive, but the changing alignments very clearly suggested a rectilinear division. as the sequence shows, the initial scene was of just the horizon and distant boats, hence the experiments up and down. The arrival of the fisherman in a red rowing boat changed the dynamics, and the instant when both he and the boat were aligned vertically in the frame made the shot. a moment later, this all fell apart. Probably the most common photographic situation in which the frame must be divided cleanly and precisely is the one that includes the horizon line. In landscapes of the type shown on these pages it becomes the dominant graphic element, the more so if there are no outstanding points of interest in the scene. Plainly, if the line of the horizon is the only significant graphic element, placing it becomes a matter of some importance, and the simple case is when it is actually horizontal (no hilly contours). There is a natural tendency to place the line lower in the frame than higher, related to the association of the bottom of the picture frame with a base. We explore this later, on pages 40-43 (Balance), but a low placement for most things in principle gives a greater sense of stability. This apart, the question of the exact position remains open. One method is to use the linear relationships described on the preceding pages. Another is to balance the tones or colors (see pages 118-121 for the principles of combining colors according to their relative brightness). Yet another method is to divide the frame according to what you see as the intrinsic importance of the ground and sky. For instance, the foreground may be uninteresting, distracting, or in some other way unwanted, while the skyscape is dynamic, and this might argue for a very low horizon, almost to the edge of the frame. There are examples of this here and elsewhere in this book (cropping, as discussed on pages 20-21, is another opportunity to explore these considerations). In the shot of Lake Inle, the form of the clouds is definitely worth making part of the image, but the clouds are too delicate in tone simply to use a wider angle of lens and include more of the dark foreground. They can register properly only if the proportion of the ground is severely reduced so that it does not overwhelm the picture. If, on the other hand, there is some distinct feature of interest in the foreground, this will encourage a higher position for the horizon. Indeed, if the sky has no graphic value and the foreground has plenty of interest, it may make more sense to reverse whatever subdivision you choose, and place the horizon much closer to the top of the frame. There is, needless to say, no ideal position even for any one particular scene and angle of view. Given this, and the kind of decisions just mentioned, there may be good reasons for experimenting with different positions. There is little point, however, in simply starting low and moving progressively higher without considering the influences and reasons. As the pair of photographs shot in Monument Valley illustrates, different horizon positions can have equal validity, depending on the circumstances of the picture, and also on personal taste. In this view of mono Lake, California, the horizon is uninterrupted and the sky empty of clouds, which simplifies the factors affecting the placement. This position approximates to the golden Section (see page 26). The atmospheric sky and mountains in this telephoto shot of Lake Inle in Burma justify a very low placement, and avoid what would be an out-of-focus foreground. The Totem Pole and Yei-Bichei rocks in monument Valley, seen from the foot of a sand dune. The texture of the dune seen in raking sunlight and the cloud pattern in the sky competed in interest, suggesting two equally valid alternative framings. A wide-angle view of Death Valley sand dunes places the interest in the details of the ripples. The setting sun gives sufficient interest to the horizon without needing more sky in the composition. One of the most predictably successful of all photographic design constructions is an internal frame. As with any established design formula, it contains real risks of overuse, and has the makings of a cliché, but these dangers are only evidence of the fact that it does work. It simply needs a little more care and imagination when it is being applied. Another part of the appeal is that by drawing a boundary around the principal image, an internal frame is evidence of organization. A measure of control has been imposed on the scene. Limits have been set, and the image held back from flowing over the edges. Some feelings of stability and even rigidity enter into this, and this type of photograph lacks the casual, freewheeling associations that you can see in, for example, classic journalistic or reportage photography. As a result, frames within frames appeal to a certain aspect of our personalities. It is a fundamental part of human nature to want to impose control on the environment, and this has an immediate corollary in placing a structure on images. It feels satisfying to see that the elements of a picture have been defined and placed under a kind of control. On a purely graphic level, frames focus the attention of the viewer because they establish a diminishing direction from the outer picture frame. The internal frame draws the eye in by one step, particularly if it is similar in shape to the picture format. This momentum is then easily continued further into the picture. Another important design opportunity to note is the shape relationship between the two frames. As we saw when we looked at the dynamics of the basic frame, the angles and shapes that are set up between the boundary of the picture and lines inside the image are important. This is especially so with a continuous edge inside the picture. The graphic relationship between the two frames is strongest when the gap between them is narrow. This pair of related photographs, taken a short distance apart, of the empire State Building and the Manhattan Bridge in New York, shows how the frame-within-frame technique can alter the dynamics of the image. In the first photograph, the viewpoint was chosen so that the image of the building butts right up to the edge of the bridge’s tower. The principal dynamic here is the correspondence of shapes, encouraging the eye to move between the two, as shown in the first diagram. From a viewpoint slightly to the right, the building can be made to fit neatly into the bridge tower’s central arch. Now the eye is directed inward toward the building, in three steps, as shown by the arrows in the second diagram. Once again, the internal frame structures the images more formally. From a low and exact camera position (one with little latitude for movement), the natural frame formed by the tree in the foreground helps to strengthen a composition in which the eye is led under the branch and up the lawn toward the building. Much of the success of using internal frames is due to finding the right correspondence of shape, followed by a combination of camera position and focal length to make the match. In this case, the undulation of the heavy silhouetted branch in the foreground creates a rotating vector to enliven the image.